(BBC)…Witnesses said someone on the float used a stick to move the power line to let the float pass, the Associated Press news agency reported. 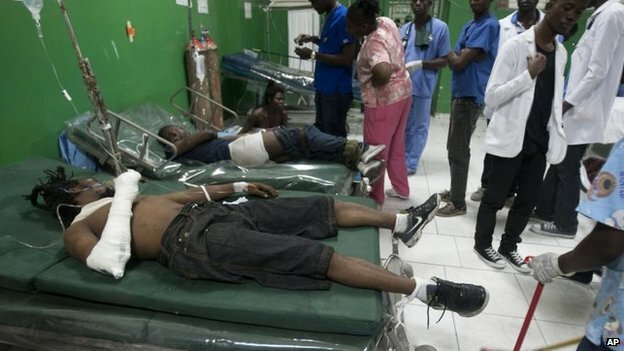 A doctor at a nearby hospital told the news agency that at least 18 people had died. Some were electrocuted, others died in the panic which ensued. Officials said another 60 people had been injured. The float, one of 16 in the parade, was sponsored by the Haitian hip-hop group Barikad Crew. President Michel Martelly gave his condolences to the victims on Twitter. “My sincere sympathy to the victims of the serious incident at Champ de Mars on the second day of carnival,” the president tweeted in French. Witnesses said some people managed to jump off the float, causing panic amid the crowd surrounding it. “I saw the wire falling and sparks and I started running for my life,” Natacha Saint Fleur told the Associated Press. Thousands of people had been attending the carnival in the capital when the accident happened.